. 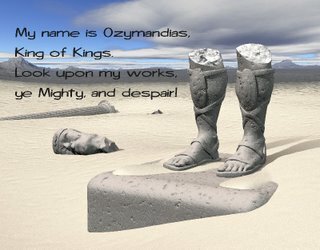 . . all that remained, in the early 19th century imagination of the English poet Percy Bysshe Shelley, of an ancient, once mighty emperor, Ozymandias, who no doubt thought his empire would last forever. Perhaps Shelley had in mind the empire of which he himself was a subject, currently approaching the zenith of its power, and wished to remind its ruling elite, ever so subtly, that their time too would come, that a little humility might not go amiss. But it is not generally in the nature of the mighty and powerful to be humble. Wealth and temporal power are mind-distorting drugs imparting to their possessors a sense of entitlement and immortality, endowing them with the arrogance to deny or defy the lessons of history. The British Empire reached the limits of its global outreach in 1922, the cartographical red dye of its jurisdiction covering 34 million km2, or twenty-five percent of the world’s land area. It lived on for a further thirty years, perhaps, huffing and puffing geriatrically through increasingly insurmountable crises in India, Iran and Egypt, until finally forced to recognise that its place in the unsetting sun of God’s grace and favour had been arrogated by the United States of America. Out of curiosity, recently I went a-searching online for an answer to the question: ‘Which empire in the history of the world lasted longest?’ It’s a surprisingly debatable question, and not only because of the difficulty in defining what an empire is, though that in itself is problematic. Consider that the British Empire never actually had an emperor (unless you count Queen Victoria’s claim to be Empress of India). Or reflect on whether the United States qualifies for imperial status. Then there is the matter of when you date the beginnings of empire. England’s Golden Age would be considered by many to have been the reign of Elizabeth Tudor – but she wasn’t even Queen of Scotland, never mind Great Britain, and the defeat of the Spanish Armada could be attributed more to good luck or the hand of God than actual naval supremacy. The exploits of Clive in India, between 1748 and 1765, when he acquired that jewel for the British East India Company – an interesting example of privatisation actually preceding state ownership and control – coinciding with the beginnings of the Industrial Revolution, can be argued with more confidence. If we run with that period, we can credit Imperial Albion with a maximum span of 200 years. One website I visited announced confidently that the crown for imperial longevity must go to the Romans, asserting that their continuous existence of 2206 years, from 753 BCE until 1453 CE could not be bettered. But do those dates stand up to scrutiny? Sure, what we count as 753 BCE was taken by Imperial Romans as the year of their foundation, all years numbered from there and labeled AUC – the abbreviation for a Latin sentence meaning ‘I’m the emperor so do as you’re told.’ Still, that year is highly questionable as a starting point for Rome’s period of imperial glory, being more mythical than factual. The Carthaginians had some claim to serious Mediterranean rivalry until they were wiped off the map in 146 BCE, but the earliest safely defensible date is probably Julius Caesar’s appointment as dictator in 44 BCE. Some might argue that converting to Christianity was the death of the Roman Empire, in which case the cut off point has to be 391 CE, when Theodosius I decreed that citizens henceforth would give up their pagan practices and follow Jesus. Even if we allow the Christianised Romans to claim imperial continuity, it is generally agreed that the city of Rome fell to barbarian invasion in 476, and with it, arguably, the eponymous empire ended too. For sure, the Empire of the East continued for a further thousand years – but contemporary Western Christendom was reluctant to count them as Roman, preferring to call them Greeks, by virtue of the language they spoke, and the need to justify the claim of Popes and their earthly disciples to be leaders of a Holy Roman Empire. Well, we could count that one, I suppose, but you can see how the whole definition thing gets exceedingly messy. 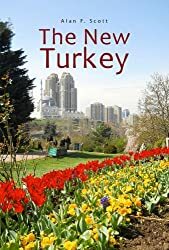 Even more so if we take seriously the claim of the Ottoman Sultans who, after conquering the eastern capital in 1453, subsequently began, with some justification, to consider themselves heirs to the Romans. In that case we can add a further 480 years to our figure of 2206. To sum up, we could ascribe any figure from a minimum of 435 to a maximum of 2,686 years! You might say the Egyptians could beat that, but then geographical size must be a major factor in defining an empire, and the Nile Valley isn’t really competitive in that department. Well anyway, I’m not taking sides in that debate. Superior minds to mine, better versed in the minutiae of historical data, continue to wrangle, and in the end, who really cares? The one thing we can say with reasonable certainty is that, in the modern age, with the advance of industrial technology, communications, economic wizardry and military hardware, the lifespan of empires seems to be getting shorter, and the record of the Romans, whatever you think it was, is unlikely to be broken. The Ottoman sultans, with a relatively undisputed collective reign of 624 years, are probably the only contenders for the title in modern times. A question often posed is, ‘Why did their empire collapse?’ and I definitely want to address that – but in the process, I think we should also consider their achievement. The beginning of serious Turkish incursion into Anatolia is usually accepted as 1071 CE, when the Seljuk Sultan Alparslan defeated the Byzantine/Roman/Greek army led by the Emperor Romanos IV Diogenes. The Seljuk Empire stretched from north India to the Aegean coast, from present-day Kyrgyzstan to the Persian Gulf, and the threat it posed to medieval Christendom was one of the major reasons for the Crusades that took place over the next 130 years. There is a good deal of impressive architecture still to be seen in Turkey today from the Seljuks and the Beylik fiefdoms that subsequently divided its Anatolian lands amongst themselves. One of these, led by a certain Osman, from whose name we derive our word Ottoman (Osmanlıin Turkish), rapidly gained supremacy, and began an expansion which would see it, by 1683, control an area of five million km2 spread over three continents, Asia, North Africa and Europe. Once again, however, the dates are debatable. What serious claim did Osman’s territory have to imperial status in 1299, the year normally cited as the beginning of the Ottoman Empire? In retrospect, the reign of Sultan Suleiman, from 1520 to 1566, is widely accepted as that entity’s Golden Age. Known in English as ‘The Magnificent’, and to Turks as ‘The Law-giver’ (kanuni), Suleiman probably came nearest to bringing Islam to Western Europe, famously turned back from the gates of Vienna in 1529. The Treaty of Karlowitz, signed in 1699 with the so-called European Holy League, is often cited as marking the beginning of Ottoman decline, being the first time they had been obliged to give up previously conquered territory. Nevertheless, it was a further 224 years before the Empire breathed its last. Decline was a long slow process during which it continued to play a significant role in European politics and power games. The Sick Man of Europe was still strong enough, in 1915, to turn back the Royal Navy from the Dardanelles, and repel a land invasion by the British Empire and its allies, while simultaneously under attack on at least two other fronts. The end, interestingly, came from within rather than without. The last sultan, Mehmet Vahdettin, having become a virtual puppet of the occupying forces after World War I, was more or less legislated out of power by the newborn Turkish Republic, and quietly spirited off to England with the tatters of his imperial power. So why did the Ottoman Empire fall? It’s an academic question. The fact is all empires fall, as Shelley warned. They are born, grow to maturity and experience a Golden Age when they feel themselves invincible and immortal, before lapsing into decline and finally death, or geo-political insignificance – a fate worse than death in the eyes of some. It happened to the Hittites and the Hapsburgs, the Moghuls, the Romans and the British – why should the Ottomans have been different? Perhaps the thing is that we in the West always looked upon the ‘East’ as ‘Other’, and have an enduring resentment of the centuries when power, wealth and prestige were centred there. We want to believe that those civilisations were somehow imperfect and corrupt, and contained within themselves the seeds of their own destruction. The reality is simpler and universal. ‘To everything there is a season, and a time for every purpose under heaven.’ The Roman Emperor Constantine I built his second Rome at the southern mouth of the Bosporus Straits because the contemporary world had shifted. The fertility of Asia Minor and its strategic location astride trade routes to the east, combined with Constantinople’s invincibility as a fortified city made it the capital of two major empires for a thousand years. What happened next, essentially, was that the world shifted again. The European Renaissance, the consolidation of nation states, and a powerful desire to avoid paying tribute for the right to pass through Ottoman territory to access the wealth of India and China, provided the spur to develop instruments of navigation and a new generation of ships that would permit sea-farers to journey west, into the unknown, out of sight of land, with some chance of finding their way home again. The result, within a century or so, was that the Atlantic Ocean became the strategic centre of a new world order. Those European countries fortunate enough to have an Atlantic seaboard, Spain, Portugal, France, England and the Netherlands found themselves in a position to exploit the riches, mineral, vegetable and human, of the Americas, Africa and beyond. Increasing wealth, competition for resources, a huge boom in international trade, led to the growth of cities, exchange of knowledge, the shift from a rural to an urban industrial society, the development of banking and capitalism – all of which created a situation where military technology advanced along with the ability to maintain professional standing armies. What happened to the Ottoman Empire? Even at the height of its power in the 16th century, it had reached the limits of its potential for further expansion. Sultan Suleiman’s failure to capture Vienna owed as much to the length of his supply lines as to the strength of Viennese resistance. Over the next two centuries, the Ottoman government lost its main source of revenue as world trade routes shifted to the Atlantic. For that and perhaps other reasons, they were unable to develop a financial system capable of financing industrialisation – their shrinking share of world trade and possibly their lack of coal and iron resources were contributing factors, as was their dependence on taxing agriculture as their second major source of income. Undoubtedly the Ottoman system of government was anachronistic and inherently unstable in a modernising world. As it became less acceptable to do away with surplus male claimants to the throne, the alternatives produced less competent sultans. Grand viziers came and went too frequently for settled policy-making. Certainly, moreover, there were powerful military and religious elites resisting change in order to hold on to their own privileged positions in society. These tend to be the reasons traditionally offered for the Ottoman decline and fall. Equally significant, however, were strengths which, over time became weaknesses. Ottoman society, for example, was tolerant of religious minorities, Christian and Jewish, according them freedoms not generally allowed in contemporary western lands. These minorities filled certain specialist roles crucial to the imperial economy. The rise of nationalism in the early 19th century, especially Greek nationalism, created serious divisions in the body politic, and severe weakening of the economy. Added to that was a huge influx of impoverished Muslim refugees displaced by, first the foundation of the kingdom of Greece, and later by the expansion of the Russian and Hapsburg empires into the Balkans, Crimea and Caucasus regions. In the final analysis, history teaches us, empires rise and fall. As the Danish philosopher, Søren Kierkegaard observed, ‘Life can only be understood backwards; but it must be lived forwards.’ What is true for a human life is equally true for the most powerful temporal empire. As humans engaged with the business of life in general, we lack the perspective to see our individual lives as a whole, and to foresee, or even to conceive our end. So it is with earthly empires. Undoubtedly the Ottomans, faced with the undeniable fact that things were not what they had been, were torn between those who saw economic, industrial and social progress as the only way to compete in the new world, and others harking back to a semi-mythical past where faith was stronger, morality black and white, life simpler and political decisions were more clear-cut. So what of the present day? A couple of years ago I paid my first visit to the United States. Going there had never been a high priority for me, so I can say I was pleasantly surprised by enjoying my stay in New York City. This is not the place to describe my holiday, but I did come away with one striking impression – that the city had had its heyday. Maybe it was the scurrying rats in the dingy subway stations or perhaps that the main architectural wonders seemed to date from the 1890s to the 1930s. It recalled to my mind memories of huge multi-headlighted cars with aerodynamic wings and fins, symbols of an empire confident in its universal superiority. Sure there were blips, such as when the Russians got the first human into space, but on the whole, American technology was ahead of the field, leading the way to a future of wealth, comfort and abundant leisure for all. The USS United States held the Blue Ribband for Atlantic crossing and the Empire State Building (note the name) was the world’s tallest for forty years. In retrospect, I think things began to change in the 1960s. The pill and the liberation of women, rock’n’roll and the rise of youth power, the divisive shame of Viet Nam, the oil crisis of the 70s, tales of CIA meddling in the affairs of sovereign states abroad, all contributed to a questioning of purpose and loss of confidence incompatible with continuing imperial hauteur. Of course the US is still the world’s largest economy, and will remain so for some years to come. However, it is also the world’s largest debtor nation, the debt totalling $17 trillion (106 percent of GDP) in 2013, or $52,000 for every man, woman and child. Were it not for sales of military hardware to Saudi Arabia, the Arab Emirates, Egypt, Pakistan, Venezuela and other ‘developing’ nations, the figure would likely be a lot worse. The new World Trade Centre, rising from the ashes of the old in downtown Manhattan will be the tallest man-made structure in the WesternHemisphere. Western financiers were able to derail the Asian economic tiger in 1998, but you can’t see them getting away with the same trick again. Empires rise and fall. Plus ça change, plus c’est la même chose. This entry was posted in Ottoman Empire, Roman Empire, Seljuk Turks, Sultan Suleyman, USA. Bookmark the permalink.